Just west of Colorado Springs, up a road that snakes through a tight canyon with sheer rock walls, lies an area known as Ute Pass, or just 'The Pass' by locals. This area is comprised of several communities; Cascade, Green Mountain Falls and Crystola/Chipita Park within a wide valley with Pikes Peak towering above. The median price of homes here is $249,300 with a population of only 12,292. Although homes here can go as high as $1.5 million, homes have sold here recently for as low as $80,000. There is plenty to do in the Ute Pass area. There is the Pikes Peak Toll Road that accesses the North Slope Recreation area which features hiking, nature watching, fishing and views from the summit of America's Mountain. Santa's Workshop, a nice little amusement park for the kids that features the highest Ferris wheel in America, is located here as well. There are many trails in the area and very popular restaurants like the Pantry and the Black Bear Inn. There is shopping in nearby Woodland Park, where the Dinosaur Resource Center is also located. 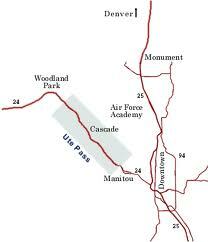 Hwy 24 is the main road in the area and provides access west to Woodland Park as well as east to Manitou and Colorado Springs and Garden of the Gods. Chipita Park Road goes through the residential areas and into the heart of Green Mountain Falls. With unparalleled views, plenty to do in an 'off the beaten track' kind of place and great schools, Ute Pass is a great place to consider buying real estate. Search the #1 site for Ute Pass Real Estate listings.